XpertMart™ employs client-server technology and as such can be used by multiple users in a network. In a network environment only one database manager (usually InterBase) is used and it resides in the server. The client terminals communicate with the server using the same network protocol, preferably TCP/IP. There are 2 steps to the installation process: installing InterBase on the server and installling XpertMart™ on the client terminal. Note that, if desired, both the server and the client can be installed on the same machine. The instructions below are for installing XpertMart™ on a network using the InterBase database manager. If you plan on using a different database manager, contact you XpertMart™ Dealer for assistance. You will need to install both InterBase and InterClient on the computer that will function as the server. It is not necessary to install Java on the server, however it is recommended since doing so allows you to run the InterClient Communications Diagnostics test. The database (normally called Main.gdb) should only be installed on the server, preferably in the following location C:\Main\Main.gdb. All of the client terminals will read and write information from this database. If you are copying a fresh database off of the installation CD, remember to remove the “read only” protection to ensure data can be written on to the database. 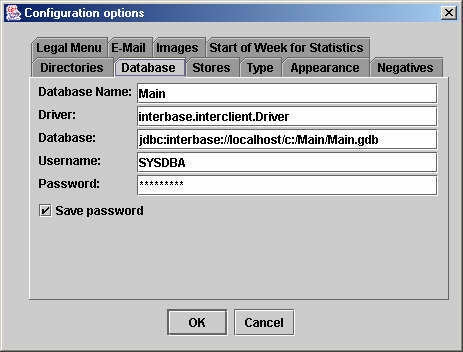 Once InterBase and InterClient have been successfully installed, the database is ready for all client terminals to use. Be sure to take note of the name of the computer that is functioning as the database server. 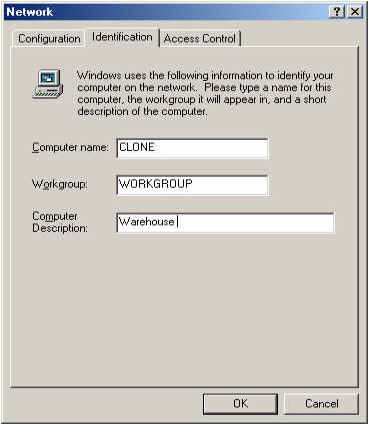 You can find the computer's name by clicking on the network icon in the windows control panel as shown in the image below, where the computer's name is “CLONE”. Note that while the IP address may vary, what is important is that the client computer is able to find the client on the network. Either of these responses mean the the network is not configured properly. Problems with the network configuration must be resolved before you proceed with the installation of XpertMart™. Once the network has been properly configured, XpertMart™ can be installed on the client computer. You do not need to install InterBase or InterClient as it is a client computer. In fact, it is strongly recommended that you do not install Interbase and/or Interclient on the client computer to avoid the possibility of accidentally writing information on a local database instead of the server. Once XpertMart™ has been installed on the client, open the program and configure the database connection before doing anything else. 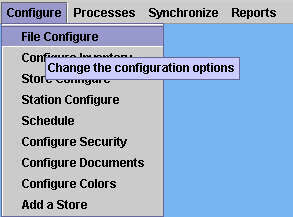 To configure the database go into the Configuration Menu and select the File Configure option as shown below. As you can see, this path specifies the location of the server (CLONE) and the database to be used (Main.gdb). Click <OK> and exit the program for the changes to take effect. The client computer is now ready use. When using a workstation connected as a client to a database residing on a server in a network, that workstation can either have its own independent set of reports or it can use those found on the server. Both methods have their pros and their cons. When using a local set of reports the important thing to remember is that any changes made to a report will not affect any of the other users on the network. However, if you require a report to be identical for all users on the network, you would have to manually copy this report from one computer to another. There is the additional problem that every time a report is run on the client computer a new connection is made to the database, through InterServer. This connection remains open even after the report has been closed. For example if you run 12 reports and close them, there are still 12 connections to the database left open. Every open connection to the database has the potential to slow down responses from the database and therefore the performance of XpertMart™. Open connections to the database are only closed when either the client or the server are shut down. If we use the same set of reports for all users on the networks, then there is only one unique version of each report and the changes made at a workstation shall be reflected in the other clients immediately after they have been saved. The disadvantage of course, is that the master report can be modified inadvertently inappropriately by one the many users on the network. Another important advantage of centralizing the reports is that connections to the database that are open when a report is run are closed when XpertMart™ is closed at a workstation. In other words, It is not necessary to shut down the computer to ensure that all connections to the database have been closed. specify this path in the configuration. In the example shown below, the Z: drive is a virtual drive that points to the server. With either of these two methods you do not need any other reports directory on the client computer. Keep in mind that any changes to this configuration do not take effect until the next time XpertMart™ is open.